Penetrations are an unfortunate requirement of most ponds. Penetrations can be required for filling systems, balancing, pumping and overflows amongst other reasons. These penetrations should be kept to a minimum and only used for water, not wiring. Any wiring for pumps or lights should be brought over the top of the liner, as these wires are usually black they blend into the rubber and become virtually invisible. 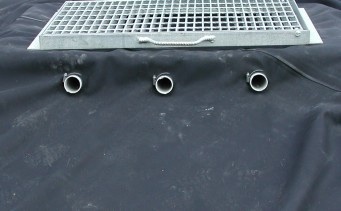 Round penetrations can be easily installed in Beutyliner pond liners. To be successful the penetration should be at least 40mm in diameter, be clean and penetrate about 50mm into the pond. Smaller diameter pipes should be increased in size using a sealed sleeve, and if the pipe needs to be longer than 50mm it should be extended after installation using a joiner. Alternatively a compression, flush fit system similar to a sink waste can be used. Draw a line perpendicular to the pipe, and measure out from the pipe half the diameter (radius). Mark this point as the centre of the hole. Cut a nice round hole, preferably with a punch, one third the diameter of the pipe (i.e. If you were using 60mm pipe, you would cut a hole 20mm in diameter). Remember, only cut the top part of the liner. Carefully stretch the Beutyliner over the pipe and it will form an upturn around the pipe. Press Beutyliner hard down onto the surface below. Fit a marine grade stainless steel hose clamp and lightly tighten. Do not over tighten or the clamp will cut the Beutyliner.